How were Sunday and Monday? Ah, if only you would write as well as you fly, we would really have something to read here. I flew all three. Didn't go anywhere outside of west towers to T of course because I'm a wimp, etc. Sunday and monday were both good, although both were less strong (IMHO) than saturday, but still with a great top of lift (>9k). My vario said I got to 10028 on monday but after I checked the tracklog the GPS and barometric altitude didn't agree so that might have actually been 9650 so maybe I didn't actually break 10 like I had though but in any case it was still a great top of lift once the sun came out for a bit. I think monday had the best lift in the later afternoon of the three -- I was trying to land due to dinner plans and after fighting to get down to 2k there were thermals coming up off the LZ everywhere so I gave up and went back up and headed down the towers ridge to burn another twenty minutes or so before finally managing to find enough sink to land. I think JD made it to somewhere in claremont on monday but I don't know any of the details beyond that. On Saturday, the GFS weather model (as viewed in XC Skies) said it would be good and high all day along the San Gabrials, while the NAM model said high clouds from the West would shut down the lift. Once in the air, it looked like the GFS was more accurate. I climbed to 10K behind Trash, but then struggled at Lukens, melting back to Little Lukens at one point. A climb at East Lukens got me to 8K+ and heading East. Brown worked, but Wilson didnâ€™t. Apparently, I crossed paths with Dietch West of Wilson, but I didnâ€™t see him. I passed a couple of paragliders East of Wilson. Dietch and five? paragliders launched Marshal and made it to (or close to) Sylmar. Ken A. was high over Wilson while I was not so high a little past it and taking a slow climb over the powerlines. Ken was in good shape to hook up and go East, but he elected for the Wilson out-and-back, which is nothing to scoff at. The climbs in the middle section were slow with light wind and smooth air. The lowest I got was 4300. I had San Dimas golf course on an easy glide, so never a worry about landing in a crap place. After that, it just got better. 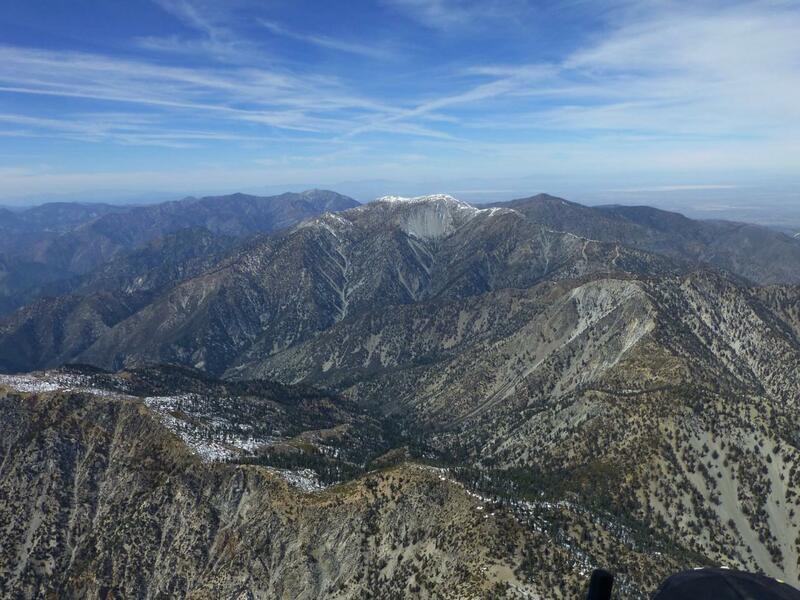 I got to 10K+ again over the rocks and snow patches of Ontario and Cucamonga Peaks. I arrived at AJX with 2700 ft to spare. It was blowing down with nobody in the air and only two gliders still set up. I didnâ€™t want to go anywhere else, so I just spiraled down. The landing conditions were ideal, though I landed in a different direction than usual. There were still a bunch of people hanging out and they offered me food and beer. Dietch had a driver, but his car wasn't big enough to haul everyone who made it from Crestline to Sylmar back to Crestline. So he sent everyone else off in his car while he hung out in the Sylmar LZ. I drove his car back to him. Iâ€™m very thankful for that opportunity. Congratulations on an awesome flight, Greg! Jonathan too! Awesome weekend and I imagine there were many other great flights. I flew from Marshall to Kagel, intersect with Greg somewhere around Monrovia Peak. Highlight of the flight was flying above Cucamonga Peak. Great photo and great flight(s) (to all of the M to S crew), especially given that bit of a headwind component.